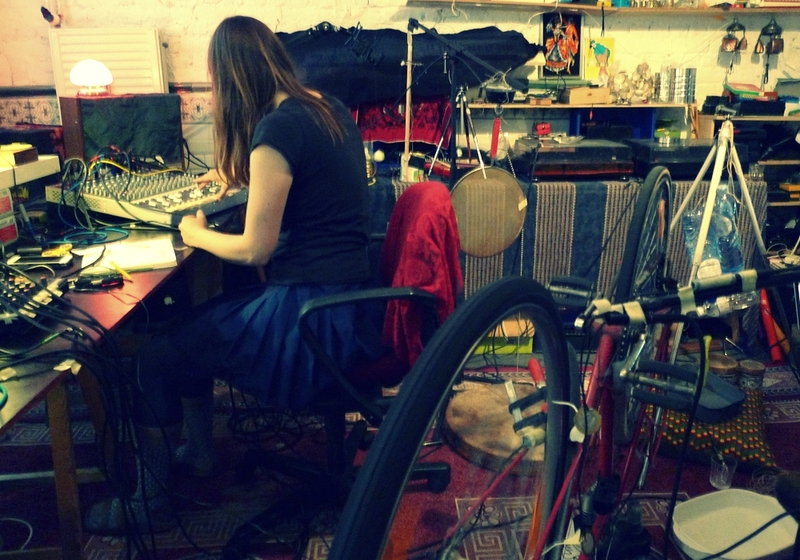 Karen Geyer is a sound artist who is active between Zurich and New York. Under the name “Grauton” (“shade of grey”) she invents and builds her own mechanical objects whose sounds she picks up using contact microphones; she then amplifies and steers these sounds via a mixing desk as if they were the instruments of an orchestra. The instruments here comprise common or garden items removed from their everyday duties, such as bicycles, fans, kettles, stools and electrical motors that Geyer manipulates by preparing them with simple materials such as wood, wire, rubber, cord and masking tape. The objects are prepared so that they play themselves, with chance factors integrated so that they constantly alter their sound. Karen Geyer may be the initiator of her sound installations, but as a musician she takes a more retiring, subordinate role and on the whole lets her machine orchestras play themselves. She chooses tracks at her mixing desk, filters or amplifies certain sounds and thereby creates compositions of noise, polymetrical structures and mechanical sounds. May 12, 2018 | Filed under Musica per la radio.